In the Seventeenth Century, English Poet John Donne wrote, “No man is an island entire of itself; every man is a piece of the continent, a part of the main. If a clod be washed away by the sea, Europe is the less….” Donne’s words seem so appropriate to me at this moment. They sum up the feelings that I and so many boxing fans are experiencing as we take in the news. Today, boxing is the less for having lost one of the great Heavyweight champions, Joe Frazier. Even now, I pause to look at the poster on the wall behind me. 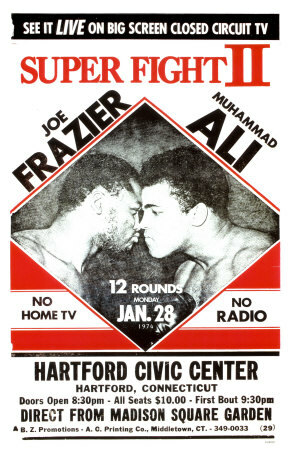 It advertises Super Fight II, and pictures Frazier and Ali staring each other down. Ali and Frazier was one of the great rivalries in a sport that has known a few. I was three when that fight took place and have no memory of it. But when it comes to professional boxing, my earliest memories are of the rivalry between Frazier and Ali, most notably their third fight The Thrilla in Manila. It was that fight which introduced me to the sport. And even though Joe Frazier did not walk away from that fight as the winner, it cemented his legend into my mind. Years later riding down North Broad Street in Philadelphia and seeing Joe Frazier’s Gym for the first time I had the feeling that it was a special place, a place where Philadelphia’s greatest champion had trained and was training a new generation of fighters. On the wall in that gym was written Joe Frazier’s creed. It read, “We sacrifice because when we give something up, something will come back; we are disciplined because without discipline there is nothing.” Sacrifice and discipline were two things Joe Frazier knew well. In 1964, he won the Olympic gold medal in the Heavyweight division. He turned professional in 1965 and fought that first fight in his adopted city of Philadelphia. From the time he turned pro in August of 1965 until December of 1967 he had fought 19 times, some months fighting twice. Out of those 19 fights, 16 he won by knockout. His overall record was 32-4-1, 27 wins by KO. In 1970 he won the World Heavyweight title in a fight against Jimmy Ellis, and in March of 1971 he agreed to fight Muhammad Ali. Joe Frazier was never one to back down from a challenge. He was the first to knock down Ali. He won that first fight on the scorecards. Frazier only ever lost to Ali and Forman. Sacrifice and discipline made him the legend that he is. The boxing world is now paying homage to one of its greatest. I have been reading statement after statement coming from people like Bob Arum, Don King, Bernard Hopkins, Manny Pacquiao, and even Muhammad Ali. Newspapers around the world are carrying the news, USA Today, The Daily Telegraph in the United Kingdom, and The Zimbabwe Mail to name a few. He has made an impact on the world, and he will be greatly missed. Lots of people dream to make a difference, and a few actually do. This outpouring from the boxing community and the world press proves that the life of Joe Frazier has made a difference. He has taught us to dream. But more than just dreaming, he has taught us to what we need to do to make our dreams a reality. If you want to achieve something great, you have to be willing to fight for it. John Donne goes on to say, “Any man’s death diminishes me, because I am involved in mankind, and therefore never send to know for whom the bell tolls; it tolls for thee.” We have all lost something in the passing of Joe Frazier. He was not just the Heavyweight Champion, or the first to knock down Ali, he was an inspiration to us all. Joe Frazier, you will be missed.